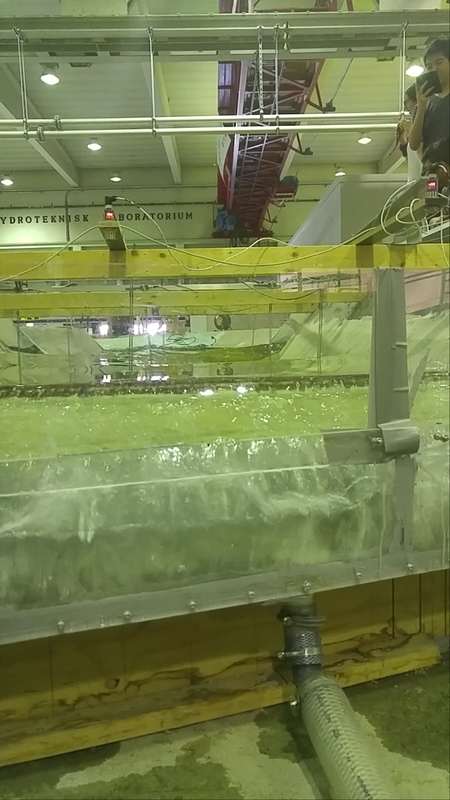 At NTNU, we visited the Norsk Hydroteknisk Laboratorium to witness drop tests in model rivers. The first week is winding down in Norway, and Trondheim is feeling more and more comfortable. We wake up before class (how much people sleep in can depend on the day) and we can take the bus or walk to class in the morning. The past few days in Trondheim have been cloudy and a little rainy for the most part, but today the skies cleared up and the sun was able to shine. The walk to the NTNU was beautiful and a nice way to wake up, even though the coffee has always been the real source of our energy. We’ve spent the past couple of days doing more lab work out in the field and in the labs at NTNU. 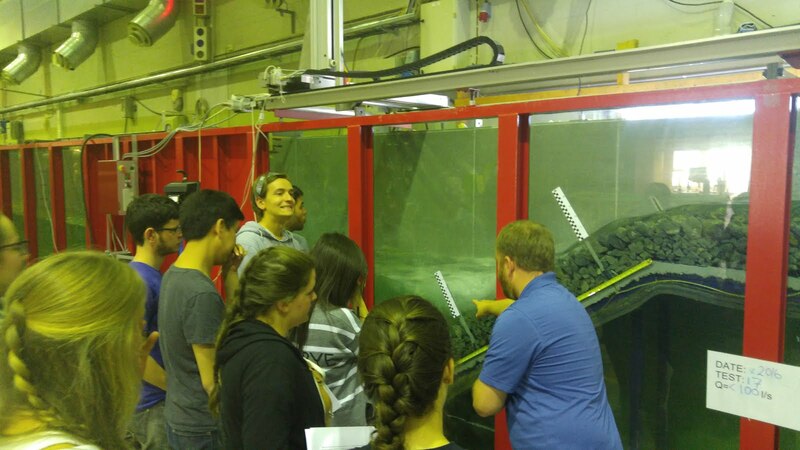 In the morning, we learned about various devices that are used to record data in open channel flows, like rivers and streams. Specifically we learned about the Acoustic Doppler Velocimeter, which can monitor the velocity of fluid flow on a three dimensional plane, and in turn this will allow the class to be able to analyze the characteristics of the flow. In the afternoon, we went into a different, much bigger lab. The Norsk Hydroteknisk Laboratorium is a facility where professors and students are able to research water flow over different terrain in models of rivers that have been scaled down. 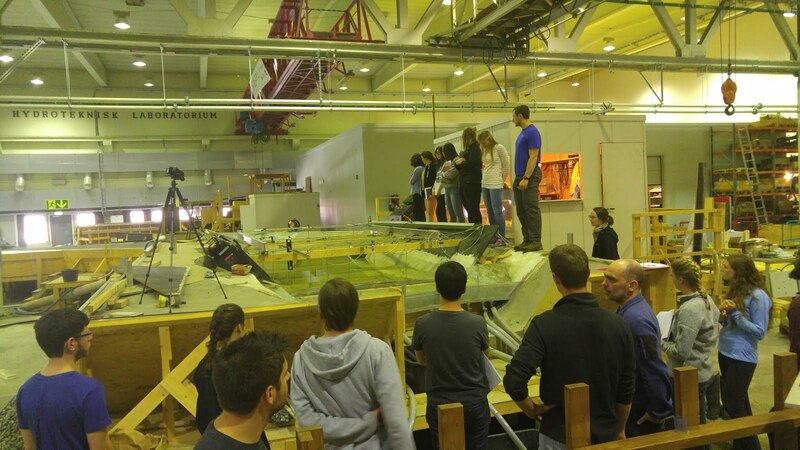 The first test we witnessed was a test where giant rocks are dropped into a model river. You could say the laboratory was really making waves in its research. 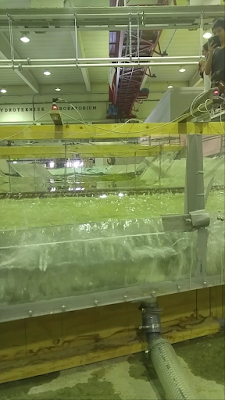 While this test doesn’t seem all too interesting to the naked eye, the drop test was used to test the force that would be put on a real life dam in extreme conditions and determine if the dam could withstand the forces. Knowing that these models are used as accurate representations of rivers that cities are centered around, puts the research in a much different light. As a senior student that will be graduating after this trip, I love learning about the ways that research and testing all culminate to improve almost every aspect of life around the world. After observing more tests and recording more data, the group returned to the hostel in the evening, and some of us went to an English pub in downtown Trondheim to watch some live music. It’s interesting to see how even in Europe, people still find ways to make a place home, even when it’s dedicating a restaurant to your own culture. Being able to learn about new things on this trip, whether it be culture, measuring devices, or physical concepts, it has all reminded me that there’s so much more to know outside of a classroom. I learn a little something new every day on this trip. Thank you so much for the pictures and posts. A lot of fun to see how things are going!